TransTex offers a full range of amine plants of the highest quality. Our amine plants go through a thorough quality control process prior to shipment to ensure quick and efficient installation, commissioning, and start-up. 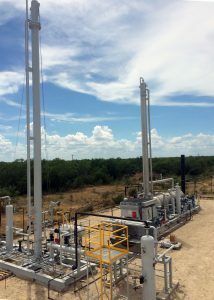 Rigorous engineering practices and operations feedback provides our team with information to deliver both equipment and services that meet high run-times and desired outlet gas specifications. Delivering service above and beyond our customers’ expectations is always our goal. Amine treating plants remove CO2 (carbon dioxide) and H2S (hydrogen sulfide) from natural gas. The process is known as gas sweetening or acid gas removal, using various alkanolamines, commonly referred to as amines. 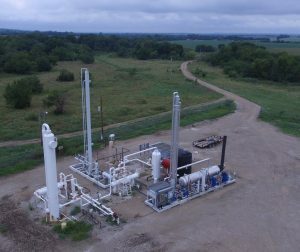 Due to the reasons stated above, most pipelines require natural gas to adhere to “pipeline spec” of less than 4 ppm of H2S and no more than 2-3% of CO2. Prior to entering cryogenic processing plants, CO2 specifications can be as low as 50 ppm. 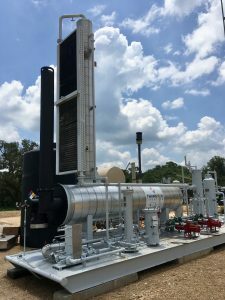 Our natural gas treating plants are available for sale or a lease option, with the standard service package including operations and maintenance. This includes a daily plant inspection to optimize plant run-time; monitoring the natural gas stream, flow, chemicals, filters, temperature and pressure. Many customers prefer a lease option in order to keep their capital expenditures to a minimum. We take pride in helping our clients find the right-sized plant for their specifications. Our gas treating plants range in size from 5 GPM up to 250 GPM. Smaller units (5, 10, 20, 25, 30, 40 & 60 GPM) are readily available. If you need a larger unit, please contact us for further information. Our promise – if we can’t help you, we’ll refer you to someone who can. Amine gas sweetening is a proven technology that removes H2S and CO2 from natural gas and liquid hydrocarbon streams through absorption and chemical reaction. Each of the amines offers distinct advantages to specific treating problems. DGA® Agent (DIGLYCOLAMINE)® A primary amine that is used in natural gas treatment applications requiring stringent outlet gas specifications, applications where oxygen (O2) is present and low-pressure applications. DGA® Agent and DIGLYCOLAMINE® are registered trademarks of the Huntsman Corporation. MDEA (Methyldiethanolamine): A tertiary amine designed to have a higher affinity for H2S than CO2 which allows some CO2 “slip” while retaining H2S removal capabilities. FORMULATED (SPECIALTY) SOLVENTS: A variety of blended or specialty solvents are available on the market. We are well versed in helping customers select the right solvent for their application; please contact us with your application today. Sour gas enters the contactor tower and rises through the descending amine. Sweetened gas flows from the top of the tower. The amine solution is now considered Rich and is carrying absorbed acid gases. The Lean amine and Rich amine flow through the heat exchanger, heating the Rich amine and cooling the Lean amine. Rich amine is then further heated in the regeneration still column by heat supplied from the reboiler. The steam rising through the still liberates H2S and CO2, regenerating the amine. The acid gases flow out of the top of the still tower and are cooled to separate them from the, now liquid, water. The condensed water is separated in the reflux accumulator and returned to the still while the acid gases are sent to flare or containment. Hot, regenerated, Lean amine is cooled in an aerial cooler and circulated to the contactor tower, completing the cycle. TransTex has a fabrication facility in Hallettsville, TX where we keep smaller units ready and available. In addition, we maintain spare parts and equipment to keep our units running at maximum efficiency. For more information about the amine treating process, and to learn what type of equipment or amines will best suit your application, feel free to contact us.